For the cat lover in everyone. 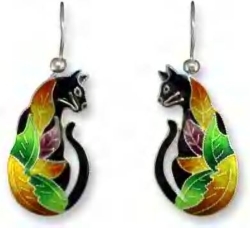 If you’re a cat lover and you want everyone to know it then check out this collection of distinctive cat jewelry and earrings. Each set is numbered and personally signed making each one totally unique. There’s a style for everyone and the prices are affordable. Most of the time if I’m looking for specialty products like these I have to go well out of my way, and then I have to pay a fortune. Never again now that I’ve got Cat Palace. The Siamese sets are my favorite as I own two. I’ve always been a fan of this breed of cat, they have a lot of personality. I know my two are a pair of characters. Another good piece is the Fanciful Feline, this is a little more dressy so if you have to get dolled up for something give these earrings a try. My wife and I love the earrings. We love our pets especially the cats. Thank you catpalace for such nice cat stuff!